Congratulations Greg! Top 100 in Western Canada! 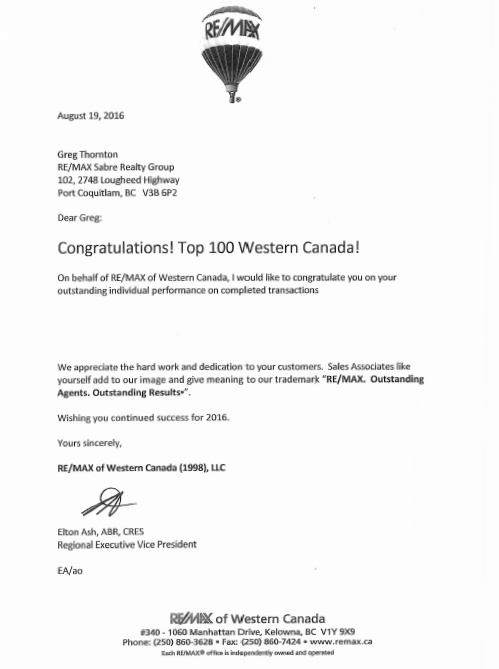 On behalf of RE/MAX of Western Canada, I would like to congratulate you on your outstanding individual performance on completed transactions. We appreciate the hard work and dedication to your customers. Sales Associates like yourself add to our image and give meaning to our trademark “RE/MAX. Outstanding Agents. Outstanding Results”. Wishing you continued success for 2016. Greg & Colin Thornton have JUST SOLD ANOTHER property at 19668 SOMERSET DR in Pitt Meadows. Greg & Colin Thornton have JUST SOLD ANOTHER property at 6481 Trent ST in Chilliwack.